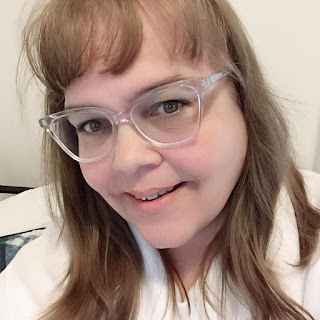 How to clean out your pantry... with us in the middle of moving and trying to clean out our pantry what a better time to share some tips on cleaning out your pantry and what works for me. My pantry was stuffed from years of stockpiling and coupon savings. I have always been good to rotate my stock so that the food doesn't expire or at least I thought I was good at it. Despite my attention to rotating my stock and purging what is not needed I did find some treasures hidden back in the depths of my pantry. I figure my pantry is pretty typical of most pantries accept for maybe some of the foods I eat but all in all pretty much typical. One of the best things I have learned is to not over shop. I find when I over shop I have way to much to use in a given time period. I am sure this will be cured a lot with the smaller location I am moving to and my lack of storage at this location. In the past I purchased things because they were so inexpensive but reality was we didn't use them so how was that being frugal at all. That was being wasteful with our resources. We are now living gluten free due to our daughter diagnosis of Celiac Disease so my pantry is going to be sorted and used with that in mind. We eat a lot more fresh fruits and veggies then we ever have before which is all in all better for us. Start with clean shelves ~ Take everyone off of your shelves and wipe all your shelves down. This way you will be able to see everything you have been storing for so long. What to toss and what to keep ~ It is much easier to take inventory of what you have when you have pulled everything out of your pantry. Decide on what you will be keeping and what you will be tossing or donating as the case maybe. If you purchased something thinking you would use and haven't yet and it is still in code donate it, if it is out of code then toss it. 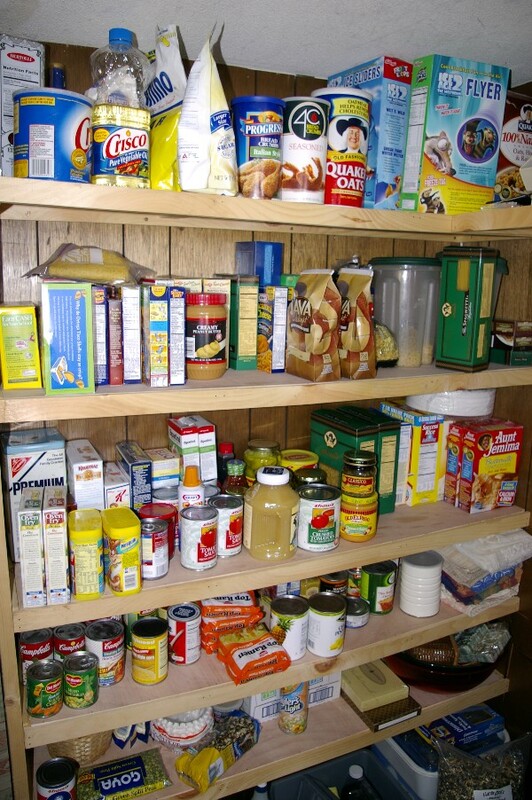 Load up your pantry ~ Once you have purged all you are going to purge it is time to load up your pantry again but this time make sure you can see everything and organize it in a useful way for you and your family. I like to organize mine with labels all out if there are cans involved and like things together. For instance all baking supplies together, all cereals together and all pasta together. You get the idea it really isn't rocket science. Organize ~ I like to keep my pantry organized by using bins and shelf dividers. It helps keep everything together and it also helps when other family members help me put away the groceries. I personally like to keep a lot of my stuff in glass jars because I can see what is in the jar and I just think it looks pretty. Again this is just me. 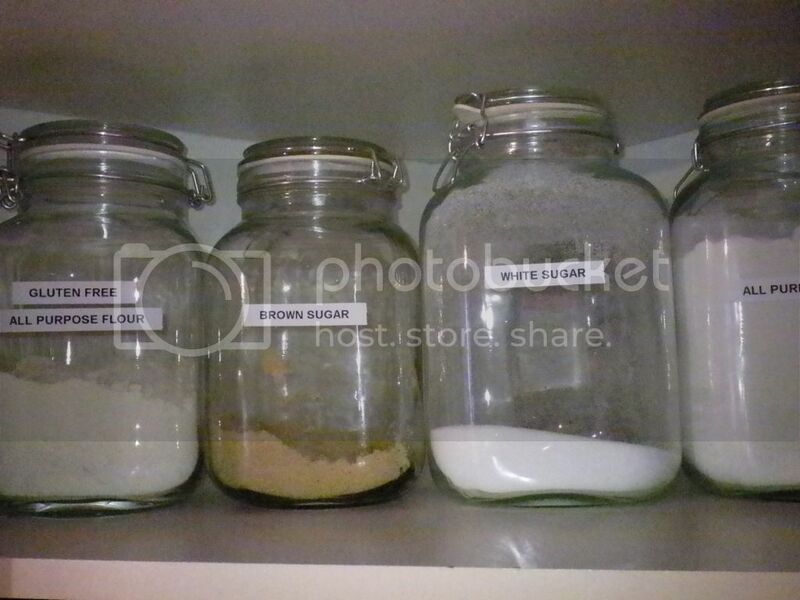 I also like to label my jars as you can see in the picture. 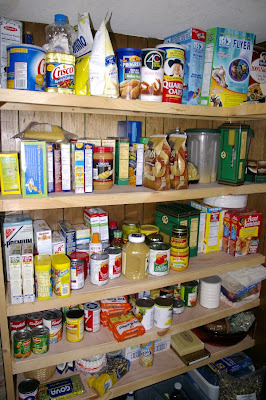 Once your pantry is all organized it will be easier to keep organized with just a few minutes of attention each week. I find every time I walk into my pantry I just do some tidying if the last person in there put things out of place.